MyPublisher is sponsoring an amazing giveaway! A total of $450.00 in prizes! Find out what my “dream guest book photo book” would be if I were to remake mine today and enter for a chance to make your own! 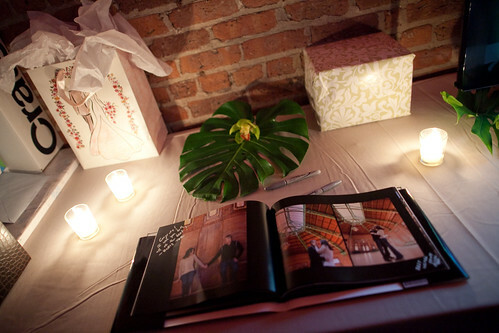 I get a number of e-mails from brides and grooms who are interested in my opinions on using photo books as guest books. For my wedding about three years ago, we used our engagement photos to make a photo book for our guests to sign. So, of course my opinion is go for it! I made my wedding guest book with MyPublisher, but back then there was only one paper offered in the Classic size and one paper for the Deluxe size. Also, the lay flat option was not available as it is now. Earlier this year, MyPublisher also increased the weight of the standard paper used in their Classic photo books (11.25 x 8.75) from 115 lbs. to 120 lbs. while the weight of their Deluxe size books (15 x 11.5) went down from 182 lbs. to 170 lbs. More recently, paper options expanded to allow for a choice for matte or satin papers in two different weights (120 lb. Superior and 170 lb. Deluxe) and the extremely reflective super gloss paper. So, no wonder why folks had lots of questions after seeing all the options. Up until recently, I couldn’t give specifics on the exact paper I would choose and why. I would have to have ordered several books to make the comparisons. I contacted MyPublisher and asked them to send me samples of the new papers so that I could review them. I locked myself in the photo book laboratory and conducted my experiments and now here’s the results. You have the option of linen, leather, photo finish or book jacket. Personally, I prefer the photo finish cover – where the image is printed directly onto the book surface. 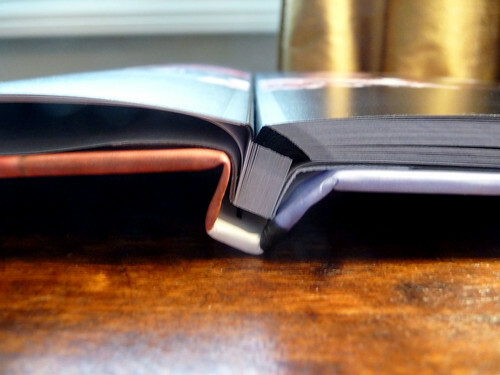 MyPublisher’s lay flat binding is hinged with a small gutter in the center. I would recommend upgrading to the lay flat option. Since your guests will be signing the book, if the pages don’t have to be held down, it will make it easier to sign. Naturally, you want to know what kind of pen works best if you plan to have folks use your photo book as a guest book. I recommend Sharpie Ultra Fine Point Permanent Markers. Other brands of permanent markers may work fine too, but I’ve only personally used Sharpies for signing photo books (and photo canvases for that matter). A permanent marker is important as you don’t want it to smudge. They dry so fast that smudging is very unlikely. For my guest book, I used black backgrounds, so I couldn’t use a black marker. I used silver, but at the time I couldn’t find that color in the ultra fine point, so I had to go with the Sharpie fine point, which in retrospect was a little too large of a nib. It made the writing look a bit messy, but lucky for you, you get the benefit of my hindsight. I don’t recommend using this. There were no issues with smudging as it dried super fast (I rubbed my finger over the writing right after) but the tip is too thick which makes the writing look a little “blobby”. Also, because it’s so bold, you will see it show through on the reverse which could potentially interfere with the image on the other side. By the way when I say “bleed through” I don’t mean the ink seeped through to the other side, which would instantly eliminate the pen from consideration, but just that it shows through the page when held up to the light. This fine point Sharpie is very bold – it shows through on the opposite side a bit. The ink does not seep through, but it’s visible. This is the Superior Matte paper. You can hardly see any of the writing show through here (it’s very faint above the trees) – this is the Deluxe Matte paper. This is the one I recommend. Like it’s thicker tipped cousin, there were no issues with smudging, but it was much more readable and no bleed through. As mentioned it comes in lots of colors too if you don’t want to use black. Black is always a classic “go to” color, but Sharpies come in a myriad of colors. So you can choose your wedding colors or whatever color you want. I don’t recommend using this. It didn’t dry fast enough (it smudged) and it didn’t write as well on the satin finish paper. I just decided to give it a try for comparison purposes. The tip was perfect, readability was very good and no issues with bleed through because the tip was extra fine, but this is a paint pen so it smudged. So, I wouldn’t recommend it since it doesn’t dry fast enough. CAUTION: Smudging! So pens number 3 & 4 (the Uniball and the Sharpie paint pen) are NOT recommended. It does eventually dry, but I don’t think you’re going to sit there and blow on each page in between guests signing your book! Here’s a shot of all four on the Deluxe Matte 170 lb. paper. There isn’t much difference as to how the signatures looked on the various papers. As you can see the fine point Sharpie on the far right is the most bold, but as mentioned the tip is too thick and can make writing look a bit messy and hard to read. Here’s a close-up. I still like the bottom one best (the ultra fine point Sharpie). Notice I picked a very popular recently married couple as a sample! If you ordered a MyPublisher book before the other paper options came out, then most likely you have a book with satin finish paper. In my experience matte finish paper in general will result in colors that are a little more muted than satin finish paper. With MyPublisher it’s no different. Although I want to stress that the difference is very, very slight, the satin paper gives a little more punch when it comes to color. Because satin paper has a hint of glossiness to it, it also produces a little more contrast. Black tones in particular reproduced with higher contrast. The edges will print a little softer with the matte finish so if sharpness is important, then go with satin. That doesn’t mean that the matte finish will result in blurry images, it just means that images printed on the satin will look sharper because of the higher contrast and more vibrant color. I don’t think one is better than the other, but it’s a matter of personal preference. The Deluxe Matte is on the left and the Deluxe Satin is on the right. The black tones are richer on the right and the green shirt in particular shows a deeper green with more detail in the folds. It is pretty hard to tell the difference though and it’s quite hard to take photos to show you the difference while trying to control glare and lighting. The matte paper does have a “classic” look to it. The satin is more “sleek”. So, if you’re having a wedding you may describe as vintage, rustic or romantic the matte may work better. I’m sure you’ve seen those soft, dreamy, warm-toned engagement photos. I think those would look fantastic on the matte paper. If you’re going modern, sleek and chic then go satin. I picture bold photographs in an urban setting with dramatic lines. I purposely didn’t test out the super gloss. I’ve made a super gloss book before, but the pages are coated and they stick together – I don’t think that paper suits this type of project since you’re going to write on it. If you’re interested in reading more about that paper, I’ve linked to it. Superior Matte, Superior Satin, Deluxe Matte and Deluxe Satin all work well for this type of project, but if it’s in the budget, I would recommend going with the Deluxe paper since a thicker, sturdier paper can’t hurt given the amount of handling it will get on your big day. You’re not going to completely eliminate bleed through of the image from one side to the reverse, but with the thicker paper, it will bleed through less and frankly, you’re not going to hold the pages up to the light as I am for testing purposes – you’ll flip through the book normally. The deluxe paper upgrade for the Classic size is only $3.99, so it’s not cost prohibitive at all. One reader (I think it was Michael P.?) wrote me that the deluxe paper in the Classic sized book may feel a bit heavy as to overall page size, and I can understand the concern, but in this case the purpose of the book may call for the higher durability and less bleed through that the heavier paper can bring. Remember guest books can be great for any occasion and aren’t just limited to weddings. Baby showers, milestone birthdays, anniversaries and bridal showers are all big events where a commemorative guest book full of well wishes would make a welcome gift for the guest of honor to take home after the party. These are my “dream upgrades”, but if your dream book has different specs, as a winner you can use the $75 towards any type of photo book you want, get upgraded endsheets, add a slipcase, etc. and if you’re not in the market for a guest book, you can make any type of book you want! Click here if you’re interested in seeing my MyPublisher reviews including overviews of the lay flat option, super gloss paper and photo finish cover (scroll down to “MyPublisher Reviews from the Blog”). Comment below – IF YOU WON, WHAT KIND OF PAPER (Matte or Satin) WOULD YOU CHOOSE FOR YOUR BOOK? This giveaway is open to anyone 18 or older. No country restrictions (so it’s international) but void where prohibited. Void in Quebec. Entries must be received by Tuesday, September 11, 2012, at 11:59pm CDT and any entries not in accordance with the rules will be disqualified at our sole discretion and at the discretion of the sponsor. Winning entries will be chosen using Random.org. After compiling the results, I will announce the winners thereafter and will email the winners. The winners will have 48 hours to respond or I will redraw another entry. Canadian winners may be asked to answer a skill question to be eligible, to comply with Canadian laws. Winners will be issued a code for the appropriate value. The gift certificate code will not expire. Cannot be combined with other promotions. May be used towards shipping costs. Shipping varies by location – see MyPublisher site for details. Disclosure: I am an affiliate of MyPublisher. If you click on a link to MyPublisher’s site and make a purchase, I receive a referral fee from the company. Regardless of compensation my opinions are my own. Thank you to MyPublisher for its sponsorship of this giveaway! Check out all the latest MyPublisher “one day deals” on my Groupon/Living Social Tracker! Check out all the latest MyPublisher promos here! Thanks for the giveaway. I like the look of matte pages so that’s what I would choose. I would choose matte paper. I would choose satin for sure! thanks for the giveaway! If I were a winner I would choose satin because I believe it shows more vibrant color! I would use matte paper. As a person who wears glasses, the glossy paper sometimes produces a glare. Also, I am a facebook fan. Main entry: I would definitely choose satin. Love the brighter colors! If I won I would choose the Matte Finish! I would love to win this keepsake to cherish forever! Liked my Publisher on FB! I would order the satin finish. I am also dying to order a MyPublisher supergloss pages book, but I am afraid I won’t like it. I have written a review of Inkubook, MyPublisher and Picaboo as Michael or Photobook guy. I just wrote a new review of SnapMyLife Creations as Michael Pack. I like my publisher on fb! I love all your reviews! If I win, I would choose the satin finish. I would choose satin paper! I would use the Satin pages. I like how Satin looks. I am a fan of the Matte finish. I subscribe to your news letter. Love the satin finish. My last photobook was fabulous. I saw this on Facebook since I’m a fan! I’m a fan of My Publisher on facebook. I would choose satin paper if I won. I would satin paper for my photobook. If I won your amazing giveaway I would order satin paper for that extra punch. I’ve also “liked” my publisher -Victoria Rodriguez Thanks for running this giveaway! I would choose satin paper for my photo book. I would love to win this and make another book…maybe a portfolio book this time with satin paper. Thanks for your help finding great book values! If I won, I would use Satin. Image crispness is a must. I have already “liked” you on FB. I have never tried MyPublisher yet and I am looking forward to using Matte paper for my next book. I also subscribe to your newsletter – thank you for all the tips on making great photobooks. Thank you for this opportunity Photobookgirl! I probably would use de luxe Matte for MyPublisher photobook. This is so exciting! I am getting married in a month and have been planning on using myPublisher for my wedding book! I have always been a fan of matte paper (over gloss), but I think you have changed my mind and I will go with Satin! I am a facebook fan of yours and just became a fan of MyPublisher. My FB name is Kristin Merrill. I would use satin paper to make a book through MyPublisher. I “liked” you on Facebook. My FB name is Amy Wood Federer. I “liked” MyPublisher on Facebook. My FB name is Amy Wood Federer. If I won I would use the satin paper! If I won, I would choose satin paper. I already subscribe to your newsletter, my name is Sally. IF YOU WON, WHAT KIND OF PAPER (Matte or Satin) WOULD YOU CHOOSE FOR YOUR BOOK? Matte! Just subscribed to your newsletter (Anthony)! I LOVE My Publisher books and I would choose the satin paper, to make my colors punch a bit more. I have subscribed to your newsletter. I already have your blog in my google reader. I would lays choose the satin paper. What a wonderful giveaway!!!! I am getting married in June 2013 and was about to start a guestbook on mypublisher! I always thought I would want the matte finish, however, after reading your review, I would go with Satin! I just liked mypublisher on facebook!!!! If I won I would use satin paper for my book. I like bold colors! I subscribe to your newsletter (and I have an RSS feed to my Google homepage). I liked you on FB. I am Joyce Peterson Walth. I liked MyPublisher on FB. I left a review on Snap MyLife. I liked photobookgirl on FB. Thanks. I would love to win one of these! sign me in for this PAPER = Matte. thks! Love this giveaway! I would choose the satin paper for my book! I would choose the Satin finish. I don’t have anything romantic or other to need soft looks. Bold is always nice with me. I receive your rss via e-mail. * Comment below – IF YOU WON, WHAT KIND OF PAPER (Matte or Satin) WOULD YOU CHOOSE FOR YOUR BOOK? #1 – I would probably choose a SATIN finish for my album as that is what I have had in the past and am pleased with it. I love matte, I am a fan on FB for both Mypublishers & Photogirl. I receive newsletter. Love this giveaway! I’d go with satin. I’d choose satin for my photo books! #2 – I just signed up and confirmed my email subscription to your Newsletter. Mandy H.
I had been following you by RSS but I just signed up for the newsletter. I would never miss one of your posts. I am a fan of yours on Facebook. Amelia Burke is the name. #3 – Already a Fan on Facebook! That’s how I heard about this giveaway. 🙂 Mandy H.
I am a fan of my publisher on facebook! Forgot to add Amelia Burke is the name! #4 – Already a fan of MyPublisher on Facebook. 🙂 Mandy H.
I am already YOUR fan on Facebook – that’s how I found out about this competition! I did a wedding photo guest book for my wedding a few weeks ago. I chose a set of Sharpie markers BEFORE reading this entry (as I’m not sure it existed yet!). Nice call on the pens – they worked perfectly for me! Although I also went for super gloss and was happy enough with that – I liked that it was sort’ve wipe clean! I am also already a fan of the MyPublisher Facebook page so I’m hoping this counts as an entry too! I would choose matte paper if I won! Liked you on FB. First Name is above and last name is Chow. I would choose satin paper for my book. I would pick Satin and I’m already your fan on Facebook (Andrea Brito). Sorry, forgot the instruction for a separate comment for each entry: I’m your Facebook fan (Andrea Brito). I liked MyPublisher page on Facebook. I liked MyPublisher on Facebook (Andrea Brito). I subscribed to your newsletter (Andrea Brito). I am a fan of your page on Facebook. My name is Kaylee L**t.
I am a fan of MyPublisher on Facebook. My name is Kaylee L**t.
I am subscribed to your newsletter as Kaylee. Thank you! I signed up for your newsletter under the first name Grace! I would choose the Matte. Thanks for all the great tips! I have been subscribing to you for a couple of years. I couldn’t find the link on the stupid smile book site. But that figures! I spent a week making a book with them as a wedding present. When I was ready to purchase, it said I never uploaded the pictures correctly and the customer rep said I needed to upload photos and start over. So never bothered remaking it. All other companies I ever used worked out just fine. I would use satin because I like as much “punch” in color as possible. I already subscribed to your newsletter under Karla Fedorak. under name Janet Troutman Hunt. I would choose the matte finish for my photo book. I’ve posted a review of My Publisher. The Satin finish shows a greater contrast…just cleaner & clearer….Would like to try this! Thanks for the great give away ! Subscribed to newsletter & confirmed.